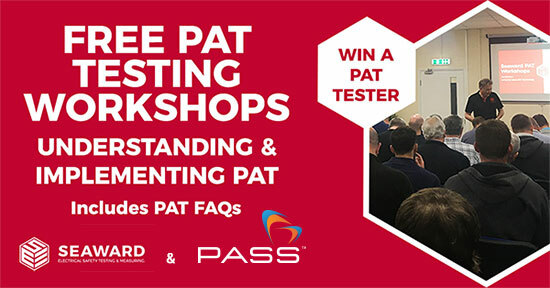 Following the huge success of the last Seaward PAT workshop we are pleased to announce that we will be hosting another Free Workshop titled “Understanding & Implementing PAT, including FAQ’s” on Friday 19th October at the PASS Electrical Training Centre in Stockton. The workshop content will be a combination of our two most popular topics: ‘Understanding and Implementing PAT’ and ‘Top PAT FAQ’s’. • Delegates can also ask their own PAT questions on the day or in advance via the online registration form. • Plus, Seaward will be offering 1-2-1 technical support and you can take a look at the latest PAT testing equipment. To give you another great reason to attend Seaward are giving attendees the chance to WIN a PrimeTest 100 PAT tester at EVERY workshop – So Don’t miss out!! To register for the event simply click the link below and fill out your details. We look forward to hopefully seeing you soon! Please note that this the only date available at this location.